If you thought that constant headaches, reddening of your skin, vomiting or even heartburn were normal after a heavy night out, then you might be wrong. Chances are that you may actually have alcohol allergy. Surprised? Don’t be. Alcohol allergy is real, and it happens because your body is deficient in an enzyme which helps in breaking down the alcohol consumed by you. If the process of breaking down the alcohol doesn’t take place, your body’s immune system gets into defense mode and triggers symptoms similar to that of an allergic reaction. This happens because of an ingredient called histamine, usually found in red wine. It’s made of yeast and bacteria, and if you are allergic and exposed to it, your face immediately starts getting puffy. Sometimes, the swelling can be severe enough to block your nasal passage. I don’t think I need to explain this one. However, know that an increased heart rate is usually accompanied by at least 1-2 other symptoms, and it may force you to sit down because you’re feeling too dizzy to focus and support yourself. For those who don’t know, hives is a sudden outbreak of red bumps on the skin. Getting hives is very common when you’re allergic to alcohol. They occur because your body is allergic to sulfites, compounds found in most alcoholic beverages. Be wary if these bumps are painful or itch a lot. And be especially careful if you’re asthmatic, because your body will respond more severely to this reaction than a non-asthmatic person’s body. The first thing to do is to stop drinking immediately till your problem subsides. This is akin to having a high fever. Your body turns bright red and very warm. Apart from that, you might feel lightheaded, dizziness or even feel like your heart is just going to explode. Different people react differently. Again, while a little bit of nausea and stomach pain is okay, severe nausea or pain in your stomach just after a couple of beers is cause for concern. Your body might be showing symptoms of allergy to histamine, which swells your blood vessels, leading to severe stomach ache. Of course, the easiest way for you to find out whether or not you have alcohol allergy is to immediately stop its consumption. And if your symptoms stop, alcohol is the cause. 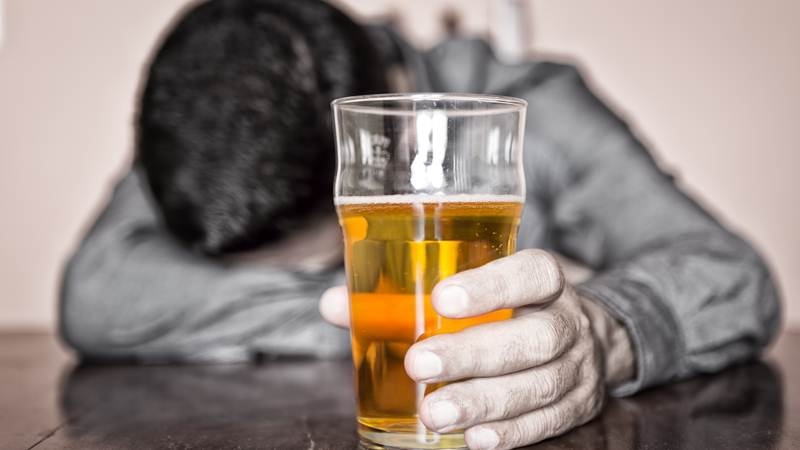 If your symptoms reappear after starting drinking alcohol, then you definitely have your answer. If your symptoms are very mild, then prescription antihistamines or over-the-counter allergy drugs will work just fine. However in the case of severe symptoms like unbearable headache, non-stopping vomiting or allergic to certain medication, it’s advisable to make a consultation with a doctor immediately. As what has been mentioned before, the only way for you to get rid of your problem is by avoiding alcohol altogether. Or, if you’re able to isolate the ingredient that gives you an allergic reaction, then the best option is to avoid alcoholic beverages that contain that particular ingredient. On the advice of your doctor, you can also carry an autoinjector that contains epinephrine, and inject it in your thigh if you accidentally drink a beverage you’re allergic to. If you've ever had severe allergy, wear a medical alert necklace or bracelet to tell others that you're allergic to alcohol. Server responsed at: 04/25/2019 5 a.m.